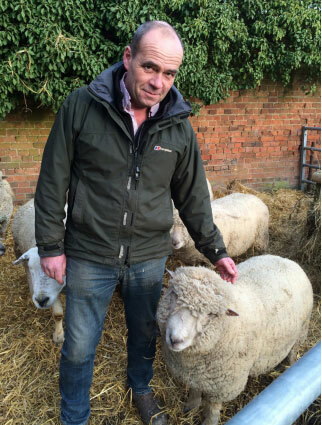 Andrew Hudson sees a good future for the Southdown breed. Breed is the starting point - using the finest breeds creates a unique depth of flavour that gives his butchery business an important point of difference from other retailers and is a reason why he has such a loyal customer base. Andrew had been finishing rare breed pigs for a local butcher when he added four in-lamb Southdown ewes to his livestock enterprise in the village of Smallburgh, near Norwich. “I wanted some sheep to keep the grass down in an orchard and bought four ewes from Hugh Clark’s Moulton flock at a sale in Newmarket. When those ewes lambed, Andrew kept the progeny and expanded the flock. Fast forward 20 years and the pedigree Gragunn flock of Southdowns now numbers 95 in addition to 30 Southdown x Charollais ewes. Andrew started growing numbers in the early 2000s, at a point when he became a partner in Tavern Tasty Meats, a butcher’s shop in Swafield, North Walsham, which specialises in traditional and rare breeds. “My partner primarily ran the shop but as time went on I became more involved and I bought my partner out in 2015,’’ explains Andrew, whose wife, Claire, is a joint director. They have since opened a second butcher’s shop, at Horning. Andrew’s dual roles of farmer and butcher are a good combination. “Being a butcher helps you to fine tune what you are doing as a farmer, you don’t always get it right but you know what you are aiming for. He runs the farm at The Grange in partnership with his mother, Mary. The 220-acre farm with its Grade 1 loam soil is mostly down to arable with grazing fields rented in for the sheep, 60 acres of mostly Broadland marsh ground. “The grazing is not the best quality land but the Southdowns do well on it,’’ says Andrew. Tupping takes place in the second or third week of October. Southdown tups have been sourced from Michael and Gail Sprake’s All Saints flock, and last September two were acquired from a sale in Melton Mowbray. “We don’t show so what we aim for is something that is going to throw a good carcass,’’ explains Andrew, who keeps the tups with the ewes and shearlings for 35 days. The Southdown produces the ideal carcass for butchers like Jack Martin, who works for Andrew and Claire at Tavern Tasty Meats. The flock scans at an average of 145% but it has achieved a scanning percentage as high as 170%. Ewe nuts and home-produced haylage is fed to the sheep pre-lambing. There is no supplementation at other times but Andrew admits he has come close to it during particularly dry summers. The flock returns to the farm to lamb indoors, with lambing getting underway on March 17th. Some of Andrew’s grazing agreements preclude him from turning sheep onto the land until April 1st so the earlier-lambing ewes and lambs remain indoors with access to sheltered open yards. Lambs are weaned at the end of July and he aims for a carcass grade of R3L or better. “As long as I get R3L I am happy,’’ says Andrew, who has the lambs slaughtered at an abattoir in Norwich. 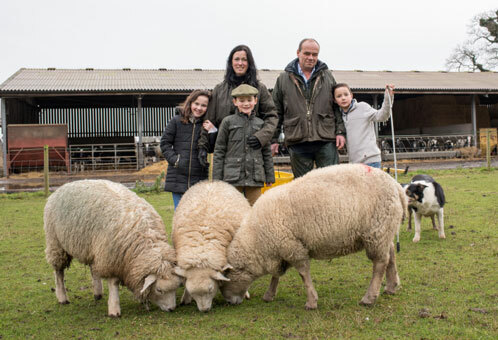 A family affair – Andrew and Claire’s children get involved in running the flock. Andrew targets a deadweight of 20kg. “The Southdowns are not a big sheep and suit this job well. With a bigger carcass, the lamb gets expensive because the joints of meat are bigger. Andrew admits he once had a sentimental approach to culling the poorer performers out of the flock but economics swayed that attitude. “I used to be too sentimental. I might have a good ewe but she would have a difficult lambing. I would think to myself that I should give her a chance at another lambing so I would keep her but at the next lambing she would get mastitis or something else would go wrong. Foot problems are few and far between so treatment is on a case by case basis. “Every now and then we footbath because we get the odd case of foot rot but we don’t do it as routine,’’ says Andrew. He sees a good future for the Southdown thanks to a movement back to more traditional carcasses but he acknowledges that is against a backdrop of good demand for very lean meat produced by Continental breeds. “The Southdown Sheep Society has done a lot to promote the breed as a way forward and there is definitely a place for it,’’ he says.